There are three stories that unfold and intertwine in “Wednesday May 9”, all of take place in contemporary Tehran and two of them are good. The film marks the debut feature of director Vahid Jalilvand, who also co-produced, co-wrote and co-edited these emotionally charged dramatic tales. Jalilvand was fortunate to land a cast with a wide range of experience – from acclaimed actress, Niki Karimi (a director in her own right) to fresh newcomer Sahar Ahmadpour, to tell stories of strong and independent women in modern-day Iran in the first two stories. While the third story isn’t as compelling, “Wednesday May 9” is a worthy entry on the festival circuit, nevertheless, having already taken top awards at last year’s Reykjavik Film Festival and the Venice Film Festival. 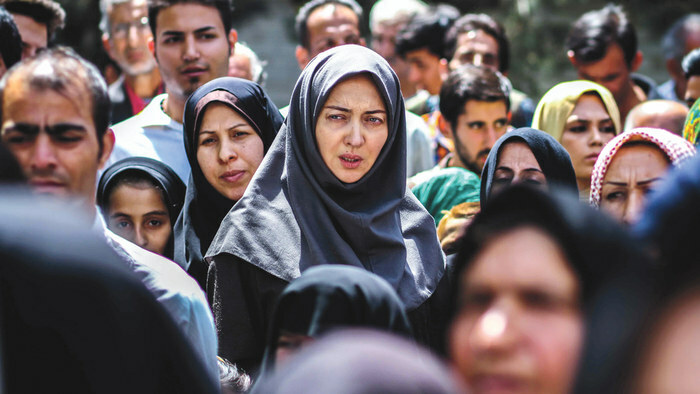 In the first story told, it’s early morning in an upscale Tehran neighborhood on the titular date where a large crowd is gathered outside an office building. They are the poor and afflicted, who have answered a mysterious newspaper ad offering 30 million romans (that’s about $10, 000) to someone in need. The local police are overwhelmed and disperse the crowd before driving off with the author of the ad, Jalal (Amir Aghaei), in tow. Just outside the vacating crowd stands Leila (Karimi), adorned in a black chador that represents her working-class religious status. She looks on with longing and sadness before heading back to her job at a chicken slaughterhouse. 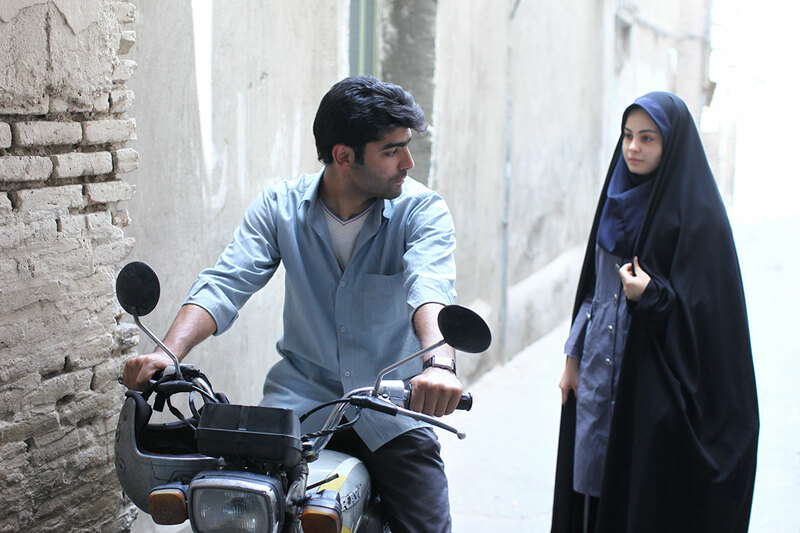 At home, her paralyzed and wheel-chair bound husband, Ali (played by director, Vahid Jalilvand), requires nearly full-time care with the possibility of an expensive operation to restore his mobility. In a bizarre coincidence, Leila finds herself riding a bus with Jalal, who we learn is actually her former finance, he jilted her years ago when he left their village. Upon hearing her situation, Jalal offers to pay for her husband’s needed surgery, an offer that isn’t received well by the jealous Ali. He promises her the money, but the jealous Ali is opposed to accepting his help. While most of the acting is solid in this first story (Ahjaei is a little stiff), the star winds up being cinematographer, Morteza Poursamadi, who frames most of his shots within windows and doors to express to effectively convey a sense of isolation. His camera also slowly pans through the distressed crowd of the disabled and disfigured that start off the film, adding an authenticity to the environment. The film then moves to a young teen orphan named Setareh (Ahmadpour), who lives in the same village and could also be a candidate for Jalal’s ad. Living with her strict aunt (Afarin Obeisi), whose volatile son, Esmaeel (Borzou Arjmand), has a raging streak of anger and jealousy toward his young cousin, which only increases when he learns that she has secretly married Morteza (Milad Yazdani), without her families blessing. Morteza is an earnest, former military man with good intentions, yet his impoverished parents have abandoned him. He had asked a now-pregnant Setarah’s aunt for her blessing in marriage, but was refused multiple times due to his social status. During a sudden altercation, Morteza accidentally breaks Esmaeel’s nose and winds up in jail with a posted amount of 30 million tomans in blood money due unless Setareh agrees to a divorce. The story here is focused on an unfortunate tradition that remains intact in Iranian society. The issue of secretive marriages and female abuse is also covered in HBO’s Oscar-nominated documentary short “The Girl in the River: The Price of Forgiveness” and hopefully the more exposure the more that can be done to support these women that are victims of an archaic tradition. beIn the third and final story, we learn more about Jalal – like why the generous benefactor would want to give away his money and where it came from. It definitely is moving seeing Jalal listen to each candidate and imagining how challenging it would be to decide who would be worthy of his offer. It’s as if the character puts himself in the position of playing God. Like Aghaei’s performance, this backstory reveal is kind of a letdown. Although, one reveal provides an interesting twist that’s provided by Jalal’s displeasing wife (Kataneh Afsharinejad), shedding another light on his benevolence, his storyline is still the least compelling of all three stories written by Jalilvand with Ali Zarnegar and Hossein Mahkam. The goal of “Wednesday May 9” seems to be an awareness of the societal trials plaguing women in Iran. It’s framed by questionable gimmick that may serve as a commentary on the pitfalls of receiving handouts. 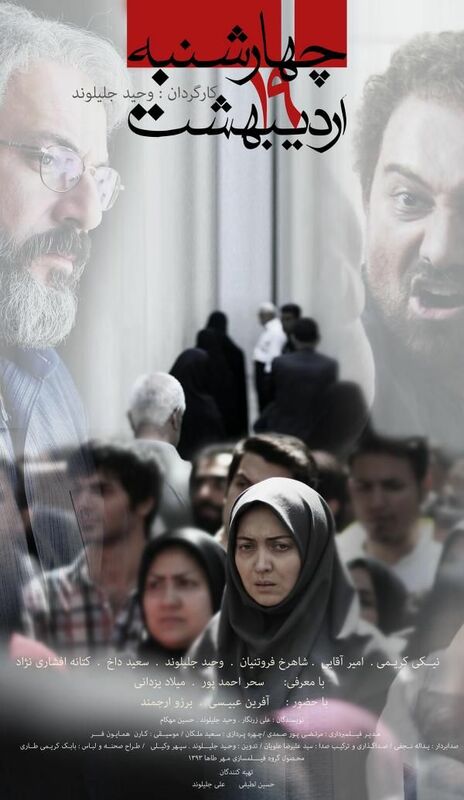 Ultimately, the solid performances by Karimi, Ahmadpour and director Jalilvand make up for the narrative and acting shortcomings of “Wednesday May 9”.